Tips and Advice for my Semi-Weak Hardware? First and foremost, I know there is a sticky at the top talking about what hardware you need, but as not all computers are equal, some settings being flipped around can make a huge difference. So, I am here to ask if anybody knows what I should set up my emulator to for better performance on my hardware? I mainly play the TimeSplitters games, and they have severe issues with lighting (Seeing lights through walls, flashing guns slow down game really bad, some graphical glitching as well with certain weapons). And I also TRY to play Spy vs. Spy, but the game runs so badly, that I don't even attempt to play it anymore. Any tips and advice for my hardware? Or is this as much I'm going to get out of this aging beast? I'll look into it, thanks. Wish I could get more out of this computer though. It's my main rig and I don't have enough money for anything better. I think your CPU can be overlooked nicely. Depending on your cooler one could probably go close to 3ghz. That would really help. 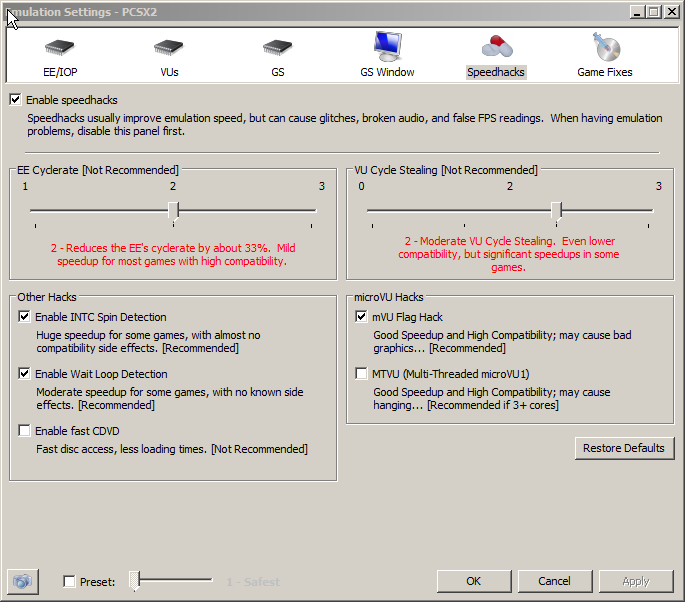 I managed to get my old C2D E4600 2.4 GHZ around 2.8-3.2 GHZ so you should be getting close to that I guess. (09-03-2015, 08:28 AM)willkuer Wrote: I think your CPU can be overlooked nicely. Depending on your cooler one could probably go close to 3ghz. That would really help. (09-03-2015, 08:43 AM)ssakash Wrote: I managed to get my old C2D E4600 2.4 GHZ around 2.8-3.2 GHZ so you should be getting close to that I guess. It's probably a laptop. So no overclocking. Yes, I am using a laptop, however, I modified some settings on my own, and hit a sweet spot, so now games run buttery smooth.